The undersigned organizations support immediate implementation of the Food and Drug Administration’s (FDA) 2014 menu labeling final rule. The final rule was the result of a deliberate multi-year process that included input from a range of stakeholders across industry, government, and public health. Chain food service establishments had more than two years to prepare to comply with the requirements and many have already changed their menus. Customers deserve access to information that will help them make healthier food and beverage choices when they eat away from home. More than two-thirds of American adults and one-third of children and teenagers are overweight or obese, increasing their risk for many of the nation’s leading chronic diseases, including cardiovascular disease, several types of cancer, and type 2 diabetes, which cost more than $147 billion annually in health care expenditures. With Americans consuming about one-third of their calories from food prepared away from home, menu labeling is an important tool that helps people to make informed decisions. Menu labeling should apply to ready-to-eat foods and beverages purchased at all chain food service establishments, including restaurants, supermarkets, convenience stores, movie theaters, and stadiums. Calorie information for each menu item in its entirety should be presented in a consistent format. Consumers should be able to easily compare menu items. The FDA already provided the pizza industry with additional flexibility to label calories per slice of pizza, as long as the number of slices is also indicated. 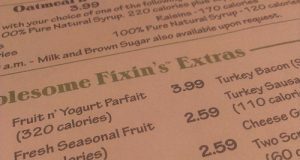 Calorie labeling should be required on all menus from which customers make food selections. This should include in-store, drive-through, printed takeout and delivery, and online menus. Calorie disclosures must be at the point of decision-making to be useful; the information should be located on or adjacent to the name of the food and price on a menu, menu board, or food label for self-service foods or foods on display and not in a separate location in the establishment.